Sun., July 8, 2018, 11:23 a.m.
YAKIMA, Wash. – Javier Serrano was returning with his family from vacation five years ago when his 2-year-old daughter Joanna began yelling in a panic as they drove through Oregon. “I got scared when I saw her, when she started yelling in pain,” he said. He took her to a hospital emergency room, where she was given oxygen because she wasn’t getting enough. She had a respiratory infection and was later diagnosed with asthma, Serrano said. Since the incident, Joanna, now 7, has gotten pneumonia about once a year and often has difficulty breathing, he said. Joanna is among an increasing number of children being diagnosed with asthma in Yakima County’s rural agricultural areas. Asthma is a chronic disease that inflames and narrows airways in the lungs. There is no cure, but it can be managed. Asthma was thought to be a disease more prevalent in densely populated urban areas where there’s more pollution from automobiles and large industry. Researchers are now focusing on children with asthma in rural, agricultural areas where fertilizers, pesticides, dust and animal waste may all be triggers. Now, after nearly five years of work, a joint study by the University of Washington and the Yakima Valley Farm Workers Clinic examining ways to improve indoor conditions for children with asthma is coming to a close. Statewide, more than 600,000 people have asthma with nearly 120,000 of them children, according to the Washington Department of Health. Although local statistics on the number of people with asthma aren’t readily available, Farm Workers Clinic experts know there’s enough children with the disease to be concerned and embark on the study. Adriana Perez with the Farm Workers Clinic was easily able to find 80 children between the ages of 6 and 12 with asthma to participate in the study; Joanna is one of them. “It’s common in the whole Valley,” Perez said. One recent afternoon, Joanna breathed into a tube affixed to an electronic device held by Perez; clouds on the device’s video screen moved as she inhaled and exhaled. The device measures breathing and whether there is inflammation in the lungs. As Perez measured Joanna’s breathing, two others helping with the study gathered small sponge-looking devices positioned throughout the house that collect tiny particulate matter in the air. They will be sent to a UW lab where the particulate matter collected will be measured. The study’s focus is to educate families on how to reduce triggers that may prompt an asthma attack in the home and how to properly use asthma medication, as well as determining whether a special air filter placed in homes can reduce impacts. Families in the study are encouraged to refrain from using ammonia-based cleaners and bleach and use mild detergents – all triggers. They’re also encouraged to vacuum twice a week with a cleaner equipped with a hepa filter (which traps small particles), use provided mattress and pillow covers that prevent contact with dust mites, and keep pets off of furniture. “So there’s a lot of advice I provide; it depends what I see in the home during a home visit,” Perez said. Often people use inhalers incorrectly; they don’t use a spacer – a tube that helps the medication get into the lungs – that comes with the inhaler, she’s found. There are two types of inhalers, one for routine use and another called a rescue that is used in episodes of sudden shortness of breath or an attack. Without the spacer, only a small amount of medication gets into the lungs. Many think the spacer doesn’t work because they cannot taste the medication when using it; not tasting the medication means it’s getting where it’s supposed to – in the lungs, Perez said. A few years ago, UW conducted a study on outdoor pollution and discovered emissions from agriculture – pesticides, fertilizers, dust and even ammonia from animal waste – were potential triggers for asthma, said Catherine Karr, a UW professor in pediatrics and environmental and occupational health sciences. Families have little control over what occurs outside, but they can make changes inside. Half of the families in the study were provided a large air filter that stands about 2 feet tall and is about as wide. The filters trap fine particles and absorb ammonia and other gases, Karr said. Data from homes with the filters will be compared to those without filters. The study’s findings won’t be released until sometime next year, but preliminary data is showing the filters make a significant difference. Joanna is in the group that didn’t receive a filter. She has two younger siblings, but is the only one in her family with asthma. 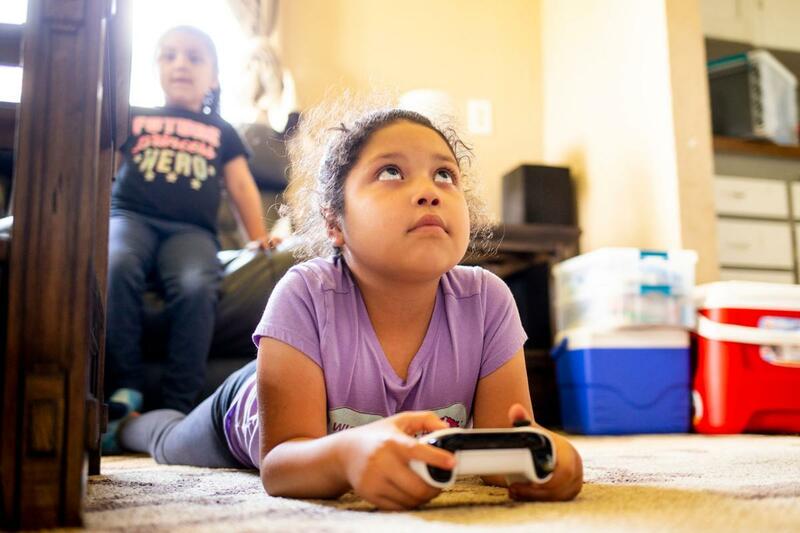 Even though her parents are making all the recommended changes, she still has asthma attacks, with her most recent about two weeks ago, said her mother, MagdaLena Torres-Serrano. “I feel bad. I feel like it’s my fault,” she said. But doctors reassure her that she’s administering the inhaler correctly and following all recommendations, she said. The home visit on this recent day marked the end of Joanna’s participation in the study, and her family was given a filter. They hope it will help. They’ve learned a lot about triggers. For example, Joanna cannot go outside when it’s raining in the spring with her little sister and brother or she’ll have an asthma attack, her dad said. Published: July 8, 2018, 11:23 a.m.